Chain stores draw many people to downtown Silver Spring, but what would it take to bring more locally-owned businesses? One of the biggest complaints I hear about downtown Silver Spring is that there are so many chain stores in the redeveloped area along Ellsworth Drive. 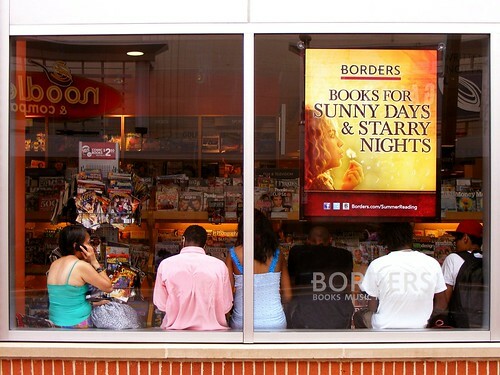 National retailers like Borders, DSW Shoe Warehouse and Red Lobster can cast a wide net, drawing shoppers from across the region who might also patronize the hundreds of locally-owned shops and restaurants throughout the downtown. However, it's worth exploring whether local retailers can be a draw by themselves. The developer is aiming to keep Mosaic’s culinary options to locally based businesses. Jessica Bruner, vice-president of leasing, says that it used to be that developers went after a chain like the Cheesecake Factory to lure other businesses. She says getting Black to commit was her Cheesecake Factory. Could this have been Silver Spring? Perhaps, if the revitalization had happened later. The first buildings in the revitalized downtown Silver Spring opened in 2002, nearly ten years ago. At the time, Silver Spring was considered a risky investment compared to more affluent areas like Bethesda and Rockville, and the county's strict liquor licensing laws meant restaurateurs were going to open up over there anyway. Not only that, but there weren't many models for projects like the redevelopment of downtown Silver Spring, so it wasn't clear what kind of stores would succeed there. The end result is a street filled with chains, who could not only pay the high rents demanded by new construction but would also be guaranteed to draw customers no matter what. 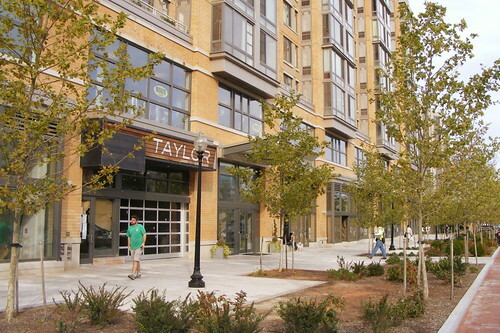 Local restaurants like Taylor Gourmet, shown here at CityVista, another Edens & Avant development in D.C., help give new suburban town centers character. It's worth noting that later suburban mixed-use developments, like Rockville Town Square and University Town Center in Hyattsville, experimented more with locally-owned businesses and different retail concepts, with varying levels of success. As downtown Silver Spring becomes more established as a place to shop, eat and drink, it's possible that we'll see more smaller, high-end retailers like those opening in the Mosaic District. That requires drawing more people to the area, largely through the construction of new housing both in and around the business district, and the creation of spaces suitable for eateries like a Taylor Gourmet or Matchbox, where the design of the restaurant is as significant as the food served there. In the meantime, there may be hope Up The Pike: Edens & Avant also owns Burtonsville Crossing, the beleaguered strip mall that's been losing many of its chain stores to the shopping center across the street. Though Burtonsville is very different from Merrifield, it does have an affluent consumer base, a growing population, and a small but critically-praised "restaurant row." If there's any place in Montgomery County that would benefit from more unique, locally-owned retail, it's right here. I feel like the main problems with DTSS "going local" are (1) the limited range of expansion for DTSS - it's really not very inviting to get off the promenade, and (2) the millstone of CityPlace. #1 is a big issue - it's hard to get people around any of the corners beyond the promenade - crossing Colesville, Georgia, Wayne are all a pain, street frontage are eaten up by garages (Wayne), malls (Fenton & Colesville), Discovery (Georgia, Colesville, Wayne). Compare that to Woodmont. What direction should SS expand in, and how can that be facilitated? 1) Discovery HQ should've had retail around the entire first floor, creating a connection between the Metro and Ellsworth Drive. They didn't build a cafeteria so that workers would patronize local restaurants, but they could've still brought some local restaurants to their building. Their attempts to beef up security will only make it harder to expand downtown retail. 2) I think the new library will help bring people down Fenton Street. The Studio Plaza development at Fenton and Thayer will help too. 3) Better streetscaping! Georgia and Colesville already have retail on them but shoppers aren't encouraged to walk down there because of heavy traffic. More street trees, wider sidewalks, outdoor dining and (perish the though!) narrowing the space given over to cars would dramatically improve the feel of those streets. #3 is so key in my mind. There are already a gazillion good restaurants in Fenton Village and while the area is doing well(adding multiple new restaurants every year), it could reach a whole new level if/when #3 happens and the area attracts people who don't know of the areas beyond Ellsworth or feel uncomfortable leaving the strip. Gary hit on a lot of the big issues. Silver Spring really needs to run with the momentun it has and begin to make other areas besides Ellsworth inviting. Some of the surface parking lots and garages should go (and they are rarely filled anyway). In addition, traffic calming and streetscaping is badly needed. Why is George six lanes accross? Wisconsin over by Friendship Heights isn't that wide and it works much better with calmer traffic and much better sidewalks. A lot of local businesses have decamped to Georgia, but I find walking along Georgia miserable. If Georgia had calmer traffic, wider sidewalks and more streetscaping and barriers from traffic, I'd be on it all the time. But as it is, every time I see Georgia all I see are missed opportunities. Going to a business along Georgia is really a miserable experience. That whole stretch should be redone and the crappier buildings (especially the ones with parking lots in front) should be redeveloped with mixed-use, mid-rise buildings. Georgia should be the center of everything Silver Spring. Instead, it's this terrible space that makes people think that Silver Spring is some crappy area. Everything Dan said really needs to happen or Silver Spring risks stagnating or falling into what it once was. Other areas aren't standing still and will be attracting people. City Place needs to become something else. Office space, apartments, whatever. It has to go. Once that happens, the rest of the bottom level around the current mall can become retail. And that whole shopping center with Giant needs to be redone into an urban shopping center, not a suburban surface lot that doesn't face East-West. In addition, East-West needs retail along it, more parallel parking, more mid-block crosses and better traffic calming. It seems to be that Silver Spring is really held back by being part of a largely suburban county. It's run by suburbanites who really don't get urbanity. They think that being able to easily drive and park somewhere is what makes an urban place inviting, which is exactly the opposite of what needs to happen. There is too much traffic in Silver Spring and far too many government-subsidized parking spaces.The DTSS area currently is treated as a suburban, weekend play ground, instead of a serious urban space for people to live, work and shop in. Dan, you haven't heard anything re Studio Plaza anytime lately, have you? There are a ton of projects under construction, a ton of projects that are progressing towards groundbreaking, and a ton that seem to have been shelved indefinitely. As far as I know, the Studio Plaza project falls into the last category (along with neighboring projects at 814 Thayer and 8260 Fenton ("The Adele")). It'd be such a huge boon to the area if it took Silver Spring Park's momentum and got off the ground. Why do people keep persisting with the argument that the sidewalks on Georgia Ave. aren't wide enough? You could fit 15 people wide across those sidewalks. You're right, some sidewalks along Georgia, especially in front of Discovery, are very wide. But the road itself is also very wide, meaning that the sidewalks can feel tight and narrow. Not to mention that they don't have a very good buffer from the noise of traffic. Would you want to eat outside along Georgia Avenue, with cars coming down at 45 mph? (Not that it's allowed, but it happens regularly.) Wider sidewalks may not always be necessary, but they'd happen if you narrowed Georgia (which should happen), and they'd be an asset to the stores, restaurants and housing behind them. The width of sidewalks needs to be proportional to the width of the street. Georgia is a wide road with fast cars. In the southern areas of it, the sidewalks are not that wide. There should be parallel parking the whole way. The road should be 4 lanes max. The speed limit enforced at 30. There needs to be more trees and wider sidewalks, especially to accommodate outside seating. What would be great is if the streetcar line from DC came into Silver Spring to terminate around the new transit center. That would royally calm traffic and be great for commuters. It's a miserable road for pedestrians and businesses. Is there a reason why you are obsessed with narrowing the main roads in Silver Spring? I hate to say this but your views on narrowing the major streets in silver spring will not attract more retail and mix use development at a faster rate. Wilson Boulevard, Fairfax Drive, Washington Blvd., and Glebe Road in Arlington are wide roads but it is far more successful than Silver Spring when it comes to rapidly attracting retail(chain and local), office buildings, and mix use development along the Ballston-Rosslyn Corridor BTW of Pentagon City-Crystal City also have wide roads(Jefferson Davis Highway-US 1) and is far more successful than Silver Spring in attracting rapid mix use development. I can't speak to Rosslyn since I never head over that far, but it's really, really low hanging fruit to make the pedestrian experience more pleasent along GA. Ave. I spent yesterday evening with friends eating and drinking outside at FS1 and then we moved up to Olazzos for a few martinis - it was a great time, but it's such an obvious flaw of the street when you have to stop your conversation because the road noise gets too loud. It's nonsensical to think GA Ave. wouldn't be doing even better if the road didn't lag so far behind all the other 21st century changes going on in DTSS.